Publisher: Toronto/Berkeley: Groundwood/House of Anansi, 2006. Opening Sentences: Thomas says that yellow tastes like mustard, but is as soft as a baby chick’s feathers. Synopsis: This amazing little book is designed to give sighted children a taste of what it’s like to be blind. The sparse text (printed at the lower edge of each left-hand page) is paired with modified braille text above it. The facing page has an illustration, but the illustrations are very different to those of regular books. The pages are all in black, and the illustrations are black as well, but are raised so that the reader can feel the pictures. There is no plot, rather “Thomas” simply describes all the colors in terms of the other senses, describes them in ways that would be accessible to blind or visually impaired children. Activities/Resources: The first activity that springs to mind is to simply talk with the child or children about what they think it would be like to be sight-impaired. This post on the Quirky Momma blog shows a touch-and-feel bag of objects that she used with her son in teaching him about blindness. 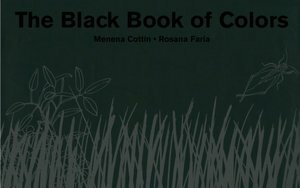 I particularly appreciate that she also mentions The Black Book of Colors! Another activity that I thought of was to do a blind-folded “trust walk” – but an article by Carol Castellano cautions against doing this. There are numerous fun activities to help children understand blindness on the BrailleSC (South Carolina) blog, and these would deal with the concerns Castellano raised in the previous article. The American Foundation for the Blind has a fabulous website to teach sighted children about blindness, called BrailleBug. Learning about Braille is just one of the activities available there. From the BrailleBug site, here is a link to Decoding Braille. Children may wonder how blind children can do art, if they can’t see color. This site talks about Art for the Blind. I found several websites that suggested sand art. Various sorts of sand art can create artworks that both visually-impaired and sighted children can enjoy with their fingertips. Sand can be added to children’s liquid paint (put it in baby food jars, suggested one website) and designs can be made that have both color and texture. Or simply draw a design on stiff paper with school glue, and shake sand over it. Once it has dried, there will be a “feelable” artwork for the child to enjoy. To think further about colors and black, an art project I remember from third grade was to color a piece of paper heavily and abstractly with many colors of wax crayon, then color over all that with black wax crayon. Then using a sharpish tool like a cuticle stick (the wooden kind) or a popsicle stick, draw through the black to show the color underneath. This sounds an interesting book Beth. Like that it also has braille in it. I remember doing the wax black over colour and then scraping a design revealing the colours underneath… loved doing that.. Something I did through work is being lead by voice while blindfolded, through a weave of squares drawn on a sidewalk, it was for team building…lol. I wanted to do a sample of the wax black over colour picture for this post, but didn’t get out yesterday to buy wax crayons. I may yet do it, just for fun! Wow, a second book about blindness today! This book sounds fascinating and your suggested resources are just great, Beth. Thanks so much for taking the time to give us so many options! Thanks, Amy. I love hunting for resources! Sounds like a very interesting little book. When I was a child, I LOVED Braille!!! I so tried to learn Braille when I was a kid. I had a book called The Story of Helen Keller which fascinated me. What a totally cool idea! I had a cousin who was blind, and although it’s impossible to imagine what it would really be like, how great to encourage children to try to understand how different the world might be for someone who can’t see – something most people take for granted. Thanks for sharing this different and interesting book, Beth! Thanks, Susanna. The challenges blind people surmount daily are amazing to me. Fantastic choice, Beth, and sure to encourage healthy empathy from seeing children and adults. Your activity ideas and resource list is excellent. Thanks so much, Joanna! When I saw this book in the bookstore several weeks ago, I was absolutely bowled over by it, and I’ve been waiting impatiently to share it ever since. Great choice. Like all the activity ideas. I hope my library has this one. More wonderful choices today. I hope your library has it, too, Stacy. It’s a wonderful book! What a great sounding book. Kids are always curious of handicapped people and I am sure this book will be popular. I remember using wax crayons on black paper and then taking a cuticle stick to make a design, too. Also in the name of innocence when I was a child I had my best friend take turns leading me around while I had my eyes shut to see what it felt like to be blind. Your resources are excellent not just for the book but for any sighted person wishing to learn more about blindness. Thanks for all your hard work. Thanks, Clar — and I love the thought of you getting your friend to lead you around blindfolded. It’s great to see a child teaching herself understanding of some other way of life! Thank you so much for your comments about the resources, and truthfully, it wasn’t hard work at all! I enjoy finding resources. Oh, wonderful, Jackie! Thank you so much for telling me about your Thomas and his Ah-Kong. This is great! Which magazine did you write “My Ah-Kong Writes with Dots” for? Where did you find this book Beth? It is absolutely stunning. A very creative way to teach children about visual impairments and empathy. I love the use of braille. Applaud the author for this very important book! Yes, it is funny we both reviewed books about visual impairments. Also enjoyed reading Jackie’s comments. The book was simply there on the shelf in our local Chapters (big-box) book store. I was delighted to find it! Most of the copies were shrink-wrapped to protect the pages, but fortunately one was opened so people could experience it. A teacher friend of mine showed me this book a couple of years ago. It is a lovely book. My friend uses it as a writing prompt for students – how to describe something without using sight references. Thanks for your review. This book looks interesting. I would like to “see” how it’s like to be blind. I would like to feel the illustrations, and feel the braille. I would like to get this book to know how it’s like to be blind. I am a student doing my 4th year at University studying my Bachelor of Early Childhood. My subject Literacies Across the Curriculum has broadened my knowledge of books inwhich I came across this fabulous book. I am implementing activities, skills children needs to know before being blindfolded and trusting others to guide them. I have purchased some slate stylus for an activity for children to discover their own names and post anywhere in their classrooms.Sand art is a focus for finger art as well. The wax crayon colours undr a black crayon is fantastic project. I have stollen the LEAD BY VOICE: being blindfolded so thanks for discussing that on this blog. These activities will be made into a book that will be used in the library after the class has used it for viewing. I am also getting the children to talk about their project to other classes so i shall let u know how it turns out. My outcome for this project is to be placed on an IMOVIE with photos and use of any digital multiliteracies the child used. The presentation will be demonstrate to the lectures, coordinators, staff from the school inwhich the children attend and parents if they would like to attend. I would love for you to view the project as it will go up on a website inwhich I shall post on here. The project doesnt finish till end of Term 1 -2013 so I shall keep you in the loop,until then.